In the late 1950’s several like minded people interested in motor cycling started meeting each Saturday afternoon at Johnny Cooper’s Motor Cycle shop in Gaol Lane, Sudbury. After a time it was suggested they formed a Club and a meeting was arranged at the Woodpecker Restaurant Market Hill (Bakers Oven). The inaugural meeting took place on 14th August 1958 and was chaired by the well known local journalist Jack Leathley junior. A previous Sudbury Motor Cycle Club folded in 1934. A guest speaker, George Bowers chairman of the Bury St Edmunds M.C.C. told those present how to start or re-start the club, what a club did, what is had to have, using as an example his own club which he helped to reform nine years earlier. He also said the club and all its members would have to become affiliated to the Auto Cycle Union (ACU). Another guest speaker P.C. Jarrold of the West Suffolk Police Traffic Department told the meeting if the club was reformed it would have the blessing of the Sudbury Road Safety Committee and the local Police. P.C. Jarrold also said “we are 100 per cent behind the idea of any club. You will not often find a bad motor cyclist in a Motor Cycle Club. If we can be of assistance we are always glad to help”. Mr & Mrs John Sargeant were elected joint Secretaries and the temporary committee was formed and consisted of Messrs R Bitten, G Berry, J R Cooper, DH Mattock, D E Walker and E E Harman. The next meeting was arranged for 18th September. At the meeting on September 18th Mr D H Steed of Great Cornard promised the newly formed Sudbury & District Motor Cycle and Light Car Club the use of land to be used as a track. A committee was elected and consisted of Chairman: Mr E Harman, Vice Chairman: Mr J Cooper, Secretary Mr J Sargeant, Treasurer: Mr G D Berry, Press Secretary: Mr P A C Keyse, Committee members: Messrs L R Bitten, C S Witt, D E Walker, Miss M Nunn and Mrs C Smith. Subscriptions were agreed at 7s 6d (38 pence) for male members and 5s (25 pence) for lady members. A club room was offered by the Spread Eagle public house in Cross Street with the first of weekly meetings starting on Tuesday September 30th. The Final Account Book for 1958 to 1962 still exists and shows from formation to the end of the year the Club was very active. There were 17 club nights, a Whist Drive and a Christmas Party as well as the affiliation to the Eastern Centre of the Auto Cycle Union on Sunday 8thNovember. Membership was 46 male members, 13 female members, 2 boy members plus another 2 members and the Club made a profit of £33. In 1959 the Club became more adventurous as well as holding Whist Drives they organised Dances entered a float in the Sudbury Carnival, entered team in the Cornard Flower Show and the extra income enabled the Club to buy table tennis equipment and billiard table. In 1960 the Sudbury Club held their first speed event at Tye Farm jointly with the Rendlesham Club (now Woodbridge Club). This was a Mountain Grass Track and a Sporting Trial which proved to be a success. The Club formed a Motor Cycle Stunt Team and attended several Fetes and the Final Accounts Book shows in 1961 the Stunt Team performed at Cornard Flower Show, Troston Church Fete, Bury Football Club Fete and Bildeston Flower Show. One of the Stunts was riding through a blazing Tunnel of Fire and at the Troston Fete one of the team went missing but returned wearing only swimming trunks, crash helmet and boots and rode through blazing fire of the tunnel. No film or photographs exist of this feat but the member was Bob Cadge of Long Melford. In 1961 the Club promoted its first Scramble and Grass Track with the help of the Halstead Club. Later in the year the Club held a Scramble for Anglia Television to be featured on About Anglia, the presenters were Bob Wellings and John McGregor. 1962 was a very big year for the young Sudbury Club they organised 5 Scrambles (only three were planned) and a Sporting Trial in December. The first Scramble was on 1st April and attracted not only the local hero Dave Bickers also his greatest rival Jeff Smith from Birmingham. The event attracted a crowd of 10,000 and was a great success. The second meeting was in May and the third meeting in July was for the Sudbury Red Cross and a dummy for first aid purposes was donated by the Club. The next two Scrambles had not been expected or arranged. The first event was arranged again for Anglia Television for another feature on About Anglia, the interviewer and commentator was Anthony Brown of ITN with local man Peter Wigg of the Ipswich Motor Cycle Club helping with the commentary. The next meeting was a total surprise it was a Scramble to be televised live on BBC Grandstand only the second event they had televised. The commentator for the BBC was Murray Walker who was well known in the motor cycle world and took place on Saturday 3rd November 1962. It rained during the event making conditions very muddy but the event was a success with the cream of the country’s top riders competing. The Sporting Trial took place in December with a 40 mile course being laid out, however it snowed over night and it looked the Trial would be cancelled. Some club members went out to see what could be salvaged and the course was reduced to two laps of 15 miles through deep snow. 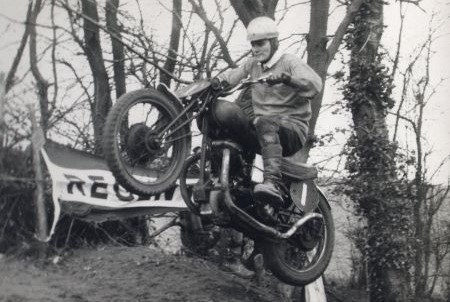 Through the rest of the 1960’s the Sudbury Club promoted Scrambles (including the annual solo and sidecars Eastern Centre Champion ships) and Sporting Trials. 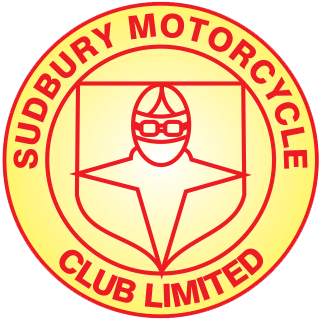 In 1966 and 1969 the Sudbury Mammoth Olde Tyme Rallye came into being the main joint promoters were Sudbury Rotary Club, Sudbury Round Table and the Sudbury Motor Cycle Club. These events held first at Great Waldingfield and then Long Melford and consisted of Traction Engine, Veteran and vintage Motor Cars and Motor Cycles, Steam Galloping Horses, Light and Heavy Horses, Models. The Sudbury Club were totally responsible for the Car Parking. The 1970s saw the Sudbury Club promote Scrambles and Sporting Trials. The biggest event was the East Anglian National Trial in a consortium with Braintree MCC, Castle (Colchester) MCC and Halstead MCC. There were 12 groups of Sections over a 50 mile course and attracted the country’s top riders over the duration of the event including the legendary Sammy Miller, Mick Andrews, Malcolm Rathmell and the three Lampkin brothers. Amongst the events held included the Solo and Sidecar Inter Centre Championships, a round of the British Championships both Solo and Sidecar. Two more Sudbury Mammoth Olde Tyme Rallyes were organised and again the Sudbury Club were joint promoters. Since its formation in August 1958 the Sudbury Motor Cycle Club have had many memorable years and one of these years was 50 years ago – 1962. The Club had planned two Scrambles and a Sporting Trial for that year but this would turn out to be different. First up was a Scramble at the now historic course at Tye Farm Great Cornard in April and the Club’s Competition Secretary 19 year old Barry Chaplin had ambitious ideas and secured entries from local rider Dave Bickers the twice 250cc European Champion and winner of 6 British Titles in his riding career together with the other top rider in the U.K. and rarely seen in East Anglia, Jeff Smith. Jeff in his riding career was twice 500cc World Champion, nine times British Champion while riding for Great Britain he won 8 Gold Medals in the International Six Days Enduro. Well what a coup and what a day as nearly 10,000 spectators turned up and were treated to your very good racing. There was a race for machines of the 1930s which local rider the legendary Jim Aim won. The second Scramble was held in May and again attracted another good entry. With the success of these two meetings the Sudbury Club decided to run a third event in July with the proceeds going to the Sudbury Red Cross. Proceeds of £132 and a dummy for the Red Cross members to learn how to perform the kiss of life costing £36 were donated. At this meeting there was a lap of honour for over 12 members of the 1930s Club. In mid August the Club was contacted by Anglia Television asking if they would run a special demonstration Scramble for them and this was filmed on a Saturday in early September with Barry Chaplin being interviewed by Bob Wellings and John McGregor did the commentating for the Television. It is believed the cartoonist Carl Giles attended this meeting and produced a cartoon for the Football Star (Green Un). Well it was all over for the Scrambles season, oh no it wasn’t the BBC wanted to televise Scramble and the Club was contacted by Ipswich’s Peter Wigg who at the time served on the ACU National Committee asking if the Club could accommodate the BBC in which 1962 was the Sudbury Clubs third year of promoting speed events. However the second ever BBC Television and Grandstand Scramble took place on 3rd November and despite the rain on the day and a very muddy track two races were transmitted on National Television that Saturday. The T.V. commentator was Murray Walker and was assisted by Barry Chaplin pointing out the various riders from the programme. For his efforts since he was 17 Barry Chaplin was nominated for the National Pinhard Prize for his organising and administration skills. Past holders of this trophy were Mike Hailwood, John Surtees, Jeff Smith and Arthur Lampkin. The Pinhard Prize is awarded to an under 21 person who has contributed either by riding or organising each year and Barry achieved the runner up spot. To finish the year the Club organised a Sporting Trial on 30th December however there was heavy snowfall overnight for the second year running but the event went on as the Sudbury Club try not to do cancel. For me 1962 was my first stint on the Committee and I was elected as Press Secretary at the age of 16. I was involved in sending out press releases to about 40 newspapers and television and had a local journalist, Alan Cocksedge, as my ghost writer and from 2008 I have the honour of being the President. Anglia Television were doing articles on some minority sports and I was contacted by the Presenter and Interviewer Cy Percival asking me if I would set something up. Filming took place in January 1971 and it is in black and white because of a union despite with colour filming.